Our restaurants, outdoor dining areas and bars. SCHLOSS Roxburghe is an excellent place to feed your body and soul with outstanding cuisine. Our food at Schloss Roxburghe is sourced sustainably, ingredient by ingredient, farm by farm, from the best local produce available. Where possible, we source from our very own estate. Scotland‘s natural larder of game, dairy products, fish, fruit, and vegetables is the chief factor in being able to create delicious culinary delights. With the Atlantic on its doorstep, fresh mountain waters, lush rolling hills, fertile soil and varied weather. Scotland is renowned for its unrivalled quality. Our first-class service team will be pleased to meet your requirements with care and attention. Whether you visit our restaurant, the bar or one of our lounges, we aim to do everything in our power to make your visit a very pleasant one. Our facilities can also be booked for private or corporate events. For further information, requests and bookings, please ask our friendly staff by using the contact form. The design and atmosphere of our restaurant invites you and your guests to linger while we look after you. Here, you can choose between our menu and à-la-carte meals. We also have an extensive international wine list. 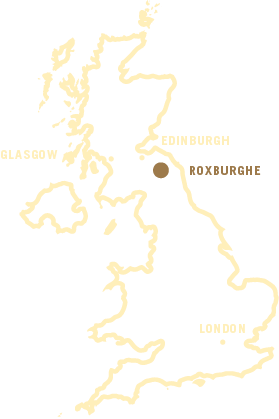 To avoid disappointment, we recommend reserving your table in advance by phoning Tel: +44 (0) 1573 450331 or by sending an email to reception@roxburghe.net. The Roxburghe breakfast includes a fabulous selection of hot and cold food, including some Scottish specialities to prepare you for the day ahead, plus a selection of fruit, yoghurt, pastries, fresh juices, tea and coffee. Sit back and relax in Schloss Roxburghe’s elegant Victorian conservatory. Beautiful and well-lit, it provides the perfect setting for events of up to 60 people and provides magnificent views of the garden and estate. The stylish, charming and historic Library Bar with its roaring open fire is an ideal place for relaxation, recharging your batteries, and bringing a successful evening to a stylish close. The warm and cosy bar serves a selection of culinary delights throughout the evening. Here, you’ll find a sophisticated retreat where you can enjoy a fine wine or other drink of your choice, plus a good book and daily newspapers. Sit back and relax in a warm and cosy lounge with where indulgent culinary delights are served throughout the afternoon, including sumptuous afternoon teas. The stylish, charming and historic lounge with roaring open fire is also an ideal place for relaxation and recharging your batteries. In this stylish lounge at the heart of the historic building, you can find a sophisticated retreat for enjoying a glass of fine wine or drink of your choice. Tastefully designed to create a relaxing atmosphere where you can enjoy wonderful views across the estate alongside an open fire. Sit back and relax in the sunshine on The Terrace. If you have an event planned, the terrace area makes for an ideal barbeque or reception location. Let your guests enjoy the beautiful surroundings of the lawn and gardens. The tastefully refurbished SCHLOSS Roxburghe lobby maintains the impressive original features and roaring open fires of the historic building. Fairways Restaurant in the Clubhouse provides a welcoming atmosphere for everyone. You can enjoy light snacks including breakfast rolls, salads and sandwiches or enjoy a reviving drink after your round.